Your Website's Design Affects Its SEO, No, Really! - Wood Street, Inc.
SEO is not just about keywords. Yes, keywords matter, but Google is much smarter than that. I recently spoke at the Grow with Google event hosted by Direct Online Marketing and Google (itself, themselves?). The focus of my session was the impact of design and UX on SEO. Design, user experience (UX), and on-site optimization all play a substantial role in how your website does with the search engines. I’ll admit, it was a little unnerving making statements about SEO in front of a bunch of Google experts. But, they nodded in agreement so I think I’m safe. Lots of code matters to Google. But, let’s focus on the updates you can make to your site today that will help your SEO. Create a unique title tag that describes page content. These signal to the engine what the page is about. 55 characters seems to be about the average. 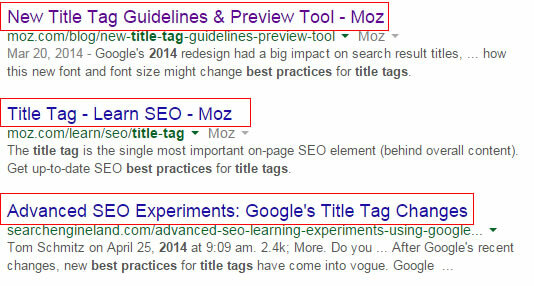 So, it makes sense to spend some time refining your title tags for pages and posts. They establish context and help sell your page to the searcher. 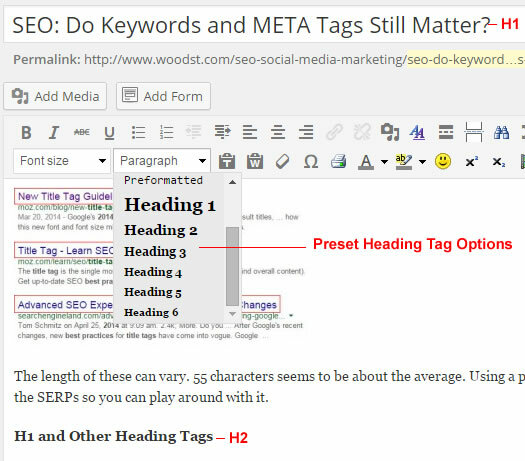 Heading tags are also important for SEO. These tags give the reader a glimpse of what the page/post and each section are about one they’re on it. The reader will glance over the headings for something that catches their eye. The search engines use these tags as indicators of context, what is in this post and what are the important topics to note. And how might this relate to the user’s intent in their search. These tags all carry different weights with the H1 tag being the most important. This is the main page heading. If you’re using WordPress, this is what you enter into the title section (see below). Remember, these tags are used by two groups: search engines and your target audience. They offer context indicators in the form of keywords to the search engines. And they give the user a reason to dig deeper. So, write them with these in mind. 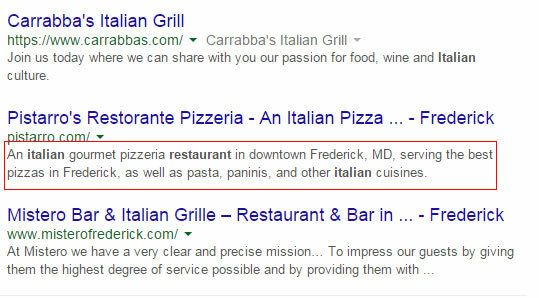 META Descriptions and META Keywords have no impact whatsoever on your ranking in the SERPs. OK, with that out of the way, what purpose do these META Description tags serve? While they do not affect rankings within the SERPs, they certainly affect click through rates. This, with the title tag, is your chance to get searchers to click to your website. They are about 150 characters (a little more than a tweet) and should be focused on that moment, when the user is reviewing the results of their search for your services. There are more tags like ALT tags, link titles, and so forth. If you want to go nuts with tagging, check schema.org for a complete list. My advice though is to focus on the ones listed above. Save yourself enough time to spend on crafting content your users will devour. Design and UX matter more today than ever before when it comes to SEO. Google wants to provide the best listings possible in the SERPs. Bounce rate – a visitor clicks on your listing in the SERP and then hits the back button returning to the SERP after they see your site/content. This shows a low value for that page. Time on site – if you get past the bounce, then the next indicator is time on site. Literally how much time the user spends on the site once they’ve clicked in from the SERPs. The more time, the better. Help visitors take the first step. Lead the way for your customers. Using design and well written content, your users are guided to where you want them to go. And when they get there, they feel they got what they came for. Reduced bounce rate, increased time on site, and backlinks (links from other sites back to yours) from social channels and other websites all help dramatically when it comes to your organic rankings in the SERPs. How many tasks are there? What can be taken out? What’s a distraction and serves no purpose? Does this page supports those goals? By removing anything that gets in the way of a good user experience, your bounce rates, time on site, and backlinks will improve. Mobile usability is a huge ranking factor as of April 21st, 2015 – MOBILEGEDDON! This is when Google updated its algorithms to penalize sites for not being mobile optimized. To be clear, this doesn’t mean that sites not optimized for mobile will be hurt in all SERPs. This only applies to SERPs for mobile users. Google wants to only deliver sites that are mobile optimized in the mobile SERPs. Makes sense. Now that you’ve established that you have mobile users and need a mobile optimized site, what’s next? Google has provided a tool to test how mobile friendly your website is. Does your site pass their test? If not, you might need responsive design or some other fix. We also wrote this post about mobile optimization that might help. Content Management Systems (CMS) Give You CONTROL! Now that you know where you can make some updates to code and you know the importance of design and UX, how much control do you have??? If you have an older site and rely on someone with HTML skills to update it – you have no control. If you have a content management system but your webmaster insists on making all the updates – you have no control. If you have a CMS but only one or two people from IT have logins, you have no control. You need a system where you can update the tags, add and edit content, and control the offers, callouts and other visual elements that drive user action. Content, images, video, calls to action – all of these make a difference in UX and with SEO. If you can’t add, edit, or delete all of these elements, you’re fighting an uphill battle. Get the barriers out of the way and regain control!! !